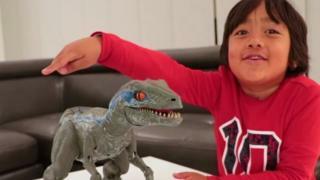 A seven-year-old boy who reviews toys has been revealed as YouTube's highest-earning star, raking in $22m (£17.3m). The estimate by Forbes magazine found that Ryan of Ryan ToysReview pipped Jake Paul by $500,000 for the 12 months to June. Videos are posted most days and one promoting a blue giant mystery egg bearing Ryan's face has had more than a million views since Sunday. Ryan's earnings, which do not include tax or fees charged by agents or lawyers, have doubled compared with the previous year. Asked by NBC why kids liked watching his videos, Ryan - who is now eight - replied: "Because I'm entertaining and I'm funny." Since the channel was set up by Ryan's parents in March 2015, its videos have had almost 26 billion views and amassed 17.3 million followers. The amount generated by sponsored posts is small compared with other top YouTubers, Forbes writes. It is "the result not only of how few deals Ryan (or his family) chooses to accept, but also the fact that his pint-sized demographic isn't exactly all that flush". The toys featured in one of the channel's videos can sell out instantly. In August, Walmart began selling an exclusive range of toys and clothing called Ryan's World, and a video showing Ryan and his parents searching for his own toys at a Walmart store has had 14 million views in three months. The revenues from the Walmart deal are set to substantially increase Ryan's total earnings next year. As he is still a child, 15% of Ryan's earnings are put into a bank account that he can only access when he becomes a legal adult. Ryan's twin sisters haven't been left out of the fun either: they feature in some videos on a related YouTube channel called Ryan's Family Review. While Jake Paul moved up six places to second, his brother Logan Paul has tumbled down the Forbes rankings this year to 10th place with $14.5m - still $3m more than 2017. Logan Paul apologised in January after showing the body of an apparent suicide victim in Japan in one of his videos. Google, which owns YouTube, removed Paul's channels from its Google Preferred programme, where brands sell ads on the platform's top 5% of content creators, in the wake of the controversy. Logan Paul: Who are YouTube's biggest stars?